Cabrini Health needed a flooring solution to assist in the design of an engaging and child-friendly space but also to comply with all of the technical and performance requirements of a healthcare facility. Assignment: To provide a flooring solution that assist in the creation of engaging, playful, child friendly environment for the Children’s Centre; whilst ensuring technical performance. Products: The Loop – custom colourway and Solid Foundation – various colourways. By 2030 we will need the capacity of two Earths to absorb carbon emissions and replenish our natural resource use. The late business icon Ray Anderson said: "If we kill nature, we will certainly kill the economy." Anderson founded the carpet manufacturing company, InterfaceFLOR, which manufactures 40 per cent of all carpet tiles laid in commercial buildings throughout the world. He was a giant among business leaders because he demonstrated that there’s no need to choose between the economy and the environment. He focused every aspect of company operations on sustainable decision-making – energy, water, suppliers, manufacturing and the life cycle of all its products. Business sustainability now has the attention of company executives as corporations are being challenged to measure, manage and report their sustainability performance. Whether due to rising operational costs, regulation or competitive pressure, sustainability management has become an urgent, complex and onerous responsibility. Few organisations have adequate frameworks or tools to easily track and manage the way they use energy, water and resource use with audit-level assurance. Many are grappling with how to monitor, benchmark and share critical sustainability data across globally distributed enterprises. Few have the capacity to assess the impact, payback period or return on investment of their efficiency and abatement programs. CarbonSystems supports Ray Anderson’s vision that corporations can be both profitable and sustainable. CarbonSystems has global clients in corporate property, banking, education, energy, government, healthcare, information technology, logistics, manufacturing, mining, and professional services. With six sites and over 600 beds, Cabrini Health comprises two acute care hospitals, a palliative care service and a residential care facility. 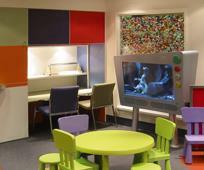 In 2004 Cabrini Health commissioned Health Science Planning Consultants with the task of designing their new Children’s centre. 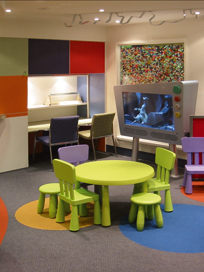 The challenge was designing a space that was engaging and ‘child-friendly’ but also comply with all the technical and performance requirements of a healthcare facility. Using the theme of the familiar streetscape, the Cabrini Hospital Children’s Centre is designed to reduce the stresses children experience with hospital visits. The clever use of shapes and bright colours from InterfaceFLOR’s Solid Foundation range supports the rest of the design elements, creating and engaging environment for the kids to play and explore the features of the Centre which include a Melbourne tram, murals, pedestrian crossings, as well as plenty of toys, books, games and even a planetarium. Apart from assisting in creating interesting features in the flooring design, InterfaceFLOR’s products also offered the superior technical performance required for the facility – low wheel resistance, slip hazard reduction, antimicrobial protection as well as easy maintenance. The end result was a relaxed and fun design incorporating a flooring solution that assisted Health Science Planning Consultants in meeting both design and serviceability objectives. The Cabrini Hospital Children’s Centre opened its doors in November 2005. A recent visit to the site revealed that the carpet was performing really well after more than two years of operation. There was very little evidence of wear or staining that you would normally find in an installation that uses lots of solid coloured carpet.